The European Union (EU) General Data Protection Regulation (GDPR) comes into force on 25 MAY 2018. 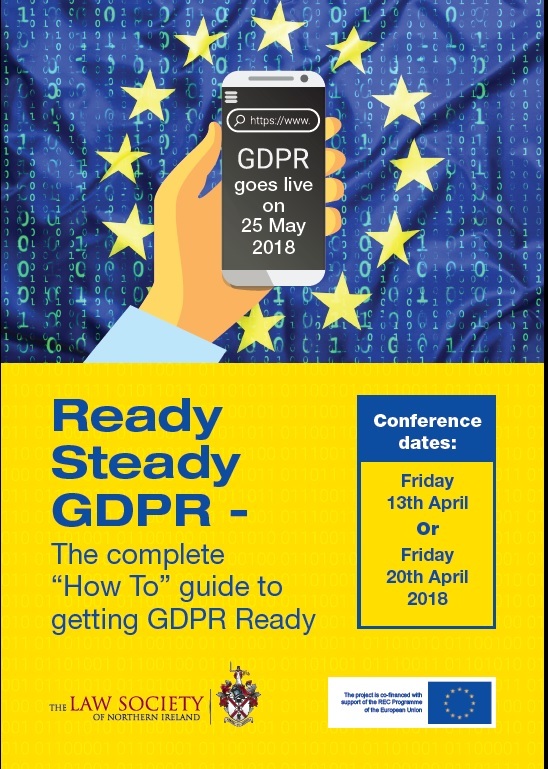 Are you prepared for GDPR? Are you equipped to advise clients about GDPR? 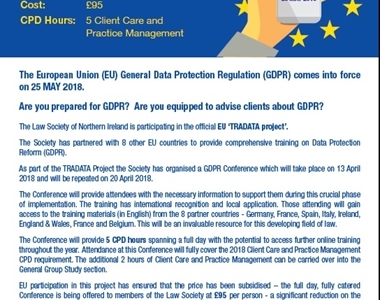 The Law Society of Northern Ireland is participating in the official EU ‘TRADATA project’. The Society has partnered with 8 other EU countries to provide comprehensive training on Data Protection Reform (GDPR). 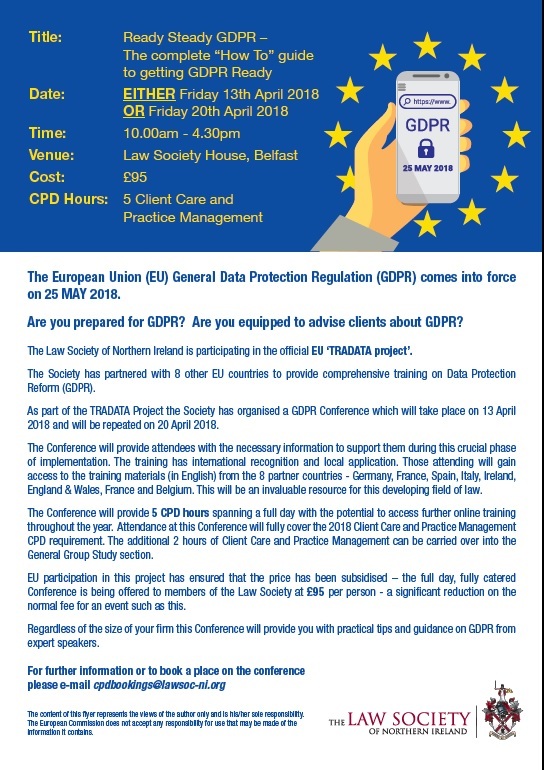 As part of the TRADATA Project the Society has organised a GDPR Conference which will take place on 13 April 2018 and will be repeated on 20 April 2018. The Conference will provide attendees with the necessary information to support them during this crucial phase of implementation. The training has international recognition and local application. Those attending will gain access to the training materials (in English) from the 8 partner countries - Germany, France, Spain, Italy, Ireland, England & Wales, France and Belgium. This will be an invaluable resource for this developing field of law. The Conference will provide 5 CPD hours spanning a full day with the potential to access further online training throughout the year. Attendance at this Conference will fully cover the 2018 Client Care and Practice Management CPD requirement. The additional 2 hours of Client Care and Practice Management can be carried over into the General Group Study section. 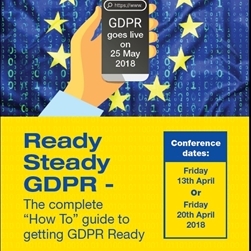 EU participation in this project has ensured that the price has been subsidised – the full day, fully catered Conference is being offered to members of the Law Society at £95 per person - a significant reduction on the normal fee for an event such as this. 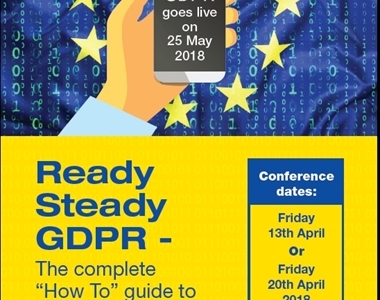 Regardless of the size of your firm this Conference will provide you with practical tips and guidance on GDPR from expert speakers. The content of this webpage represents the views of the author only and is his/her sole responsibility. The European Commission does not accept any responsibility for use that may be made of the information it contains.